CASLPA News: New Name. New Logo. New Brand. On behalf of your Board of Directors, I am very excited to share with you our new brand platform, which includes our association's new name, new logo, new tagline and even new terminology! This rebranding project has taken over a year to complete. It has involved extensive market research, in-depth interviews and surveys and some of the most creative minds in the Canadian branding, marketing and advertising industry. This project has also involved support and input from various members, your Board of Directors and staff. I can't imagine a better way to start off our association's 50th year. And yet, launching our new brand is just the beginning: it's part of a very detailed and long-term strategic plan to promote our professions to health-care professionals, educators, politicians, decision-makers and, of course, the Canadian public. Although members are seeing the new brand today, the official public launch is not scheduled until later this week (our website and our social media accounts will not incorporate our new brand until the public launch). Krystle van Hoof, CASLPA's former Director of Communications and Public Affairs, has written an in-depth article about our new brand for Communiqué. Her article (included below) introduces our association's new name and logo and gives you a behind-the-scenes look at how our new brand platform evolved. This is one article I strongly encourage members to read in its entirety; this is our brand and we are the most important brand champions of all. Rolls off the tongue a bit more easily, don’t you think? Note: the acronym is pronounced ESS-AY-SEE. Similar to how the National Arts Centre is pronounced N-A-C. As with any new name, we will work hard to let people know what we’re now called and how to pronounce it. Members, Board Directors and staff have experienced it for years: people’s eyes glaze over before we’re halfway through saying our association’s name. Many have even said that they’ve stopped using it altogether. That’s not very good for brand recognition! What’s most important? Where we are, what we are or who we represent? We think it’s the professions we represent. There’s no need to stick Canadian and association right up front and, if we’re looking to reduce the length, we don’t really need association in our name at all. We removed pathology from our name for the sake of brevity and clarity. It’s imperative that our new name be short, memorable and easy for the public to understand. The name of the professionals — speech-language pathologists — is a protected title and will not change. 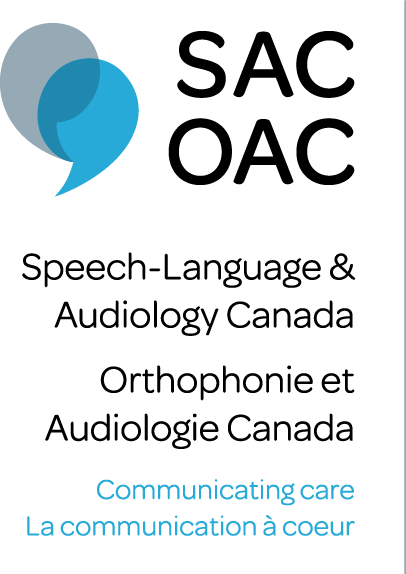 Although pathology is no longer included in the association's name, we will continue to use speech-language pathology and speech-language pathologists in our advocacy, advertising and communication materials. The agency reviewed our brand research and conducted interviews to help uncover our universal truth. In each of their meetings, they saw how dedicated we are to championing the professions we represent and how much we believe in the amazing work our members do. Everything in our messaging strategy stems from these two defining phrases. A big part of any branding project is thinking about, defining and redefining the words and phrases you use to describe yourself. When we’re writing a press release for the public or an advocacy piece for MPs, we often struggle to find ways to refer to our member professions without repeating the full list of speech-language pathologists, audiologists and supportive personnel over and over again. We’ve tried the widely used communication professionals but it’s too easily confused with communications professionals, which is what I do for a living — not our members. And, many members felt the word communication was misleading because it is not inclusive of their full scopes of practice. It quickly became clear to us and to our agency that we would probably never find a term that encompassed everything our member professions do. However, to communicate effectively about our members, we needed something. Does everything our member professions do fall within the realm of communication or of health? Perhaps not. But, by creating a new term, we will define it as we see fit. Communication health is greater than the sum of its parts. We define communication health as everything within the scopes of practice of our member professions. And, with the proper promotion, others will come to understand this too. Consider this: dentists are doctors who safeguard oral health. Oral health can be anything from tooth decay to diseases affecting the oral and maxillofacial region. But they’re still called dentists (dent = teeth). This term doesn’t simplify what they do, it just gives us a recognizable way to talk about a complex profession. If someone doesn’t know that a dentist can screen for oral cancer, should we change the name of the profession or educate the public about a dentist’s scope of practice? A tagline is a short phrase that describes what you do for your target audience. When it comes right down to it, we communicate. We tell MPs, the media and the public about our members; the impact their work has on the lives of the people they help; and what the professions need in order to be effective. We communicate with partner organizations to develop best practices and new research. We then communicate all of the above to our members. What are we communicating about? Mostly, it’s our members. If you were to ask an SAC staff member what we tell people when we’re asked about our members, most of us would probably tell you that we are incredibly impressed and humbled by how much our members care. We would also tell you about how their day-to-day work changes people’s lives. Our members see the connections between communication health and a happy, healthy life. We tell people about the care our member professions provide, the passion they have for their work and their dedication to improving the lives and maximizing the potential of individuals with communication health challenges. When we think about brands and branding, most people consider the logo to be a brand’s defining characteristic. We are visual creatures, after all. Once you’ve done the work of defining and communicating what you want people to think about your brand, it helps to have a visual marker to bring all of those things to mind without having to verbalize them. That’s what a logo does. When I look at the logo now, it seems so simple; it’s hard to believe how much time, thought and energy went into creating the final version. We began by choosing a ‘mood board’, which is a compilation of colours, photographs and words, meant to evoke the ‘mood’ we wanted our logo to have. Next, we received rough logo ideas and narrowed it down. We then explored colour choices. Throughout the process, we ensured that we had the Board’s approval, we consulted various members and sought out reactions from staff. Finally, we settled on what you see here. With any logo, you can always give a hundred explanations for why it works and what it’s meant to represent. You might see the intended meanings or you might not. Either way, what really matters is that it is simple, memorable and conveys the feeling you want your brand to evoke. The two overlapping shapes hint at quotation marks, speech bubbles, the shape of an ear or a hearing aid. Two intersecting shapes represent the two separate yet intersecting professions we represent. The two shapes together form a loose outline of a heart, getting at the idea of care. Using blue creates continuity with our former logo. The combination of blue and grey gives the logo a professional, crisp look, helping to create a visual balance between care and professionalism. The font is modern (sans-serif) but has rounded lines, which gives the logo a professional, yet friendly and approachable look. Of course, there’s a lot more to our visual brand than just a logo. We have a whole book that defines our primary and secondary colour palettes, our fonts, the type of imagery we use, how to use photography and more. But I won’t get into those details here — I’m sure you’ll find it far more interesting to see the new brand in action as we roll out new pieces in the months (and years!) to come. So we have a new brand. Mission accomplished? Far from it! If branding is the process of defining who you are and how you talk about yourself, marketing is going out and telling people. In the spring of 2014, we will launch a national advertising campaign. This campaign will be the beginning of an ongoing effort to educate the Canadian public about the professions and the importance of communication health. I can’t share the campaign details with you at this point but I can tell you that, when we presented the initial concepts to the Board of Directors, their reaction was overwhelmingly positive. As I’ve said from the beginning, branding is not something you do and then finish. A brand is something that must be lived and cultivated every day if it’s going to be successful. In our work to promote your professions, it’s essential that we not only grab attention, but also hold on to it and sustain the momentum over a prolonged period of time. While the branding project began with our current strategic plan, it’s not going to end with it — the SAC brand will live and grow with the association. McMillan, our branding agency, put together a short video to introduce our new brand to members. Click here to watch! Copyright © 2014 SAC | OAC, All rights reserved.